* Allows you to enter and save your profiles with pictures for friends & family. * Sun sign as well as Moon and Rising sign information and daily horoscope is always free. 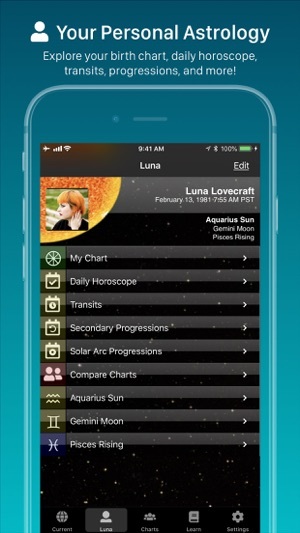 * Includes detailed descriptions as well of the house position for Sun and Moon in your chart. * Up to the minute chart of the current astrology is a finger tap away. * Using your default location, or your phone’s GPS, the app centers the chart on your current position. 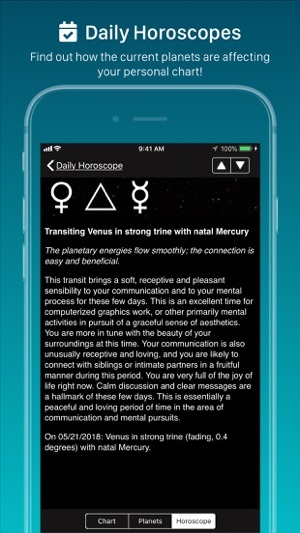 * Moon phases and upcoming Mercury retrograde periods are placed on the home screen for easy reference. * Create colorful and meaningful chart graphic plus analysis, for just 99¢ each. * These are professional level charts, with insightful interpretations of each feature. * Gives access to more than 25 pages of text on natal planets in signs and houses, plus aspects. * Instantly share your charts with friends via email or Twitter. 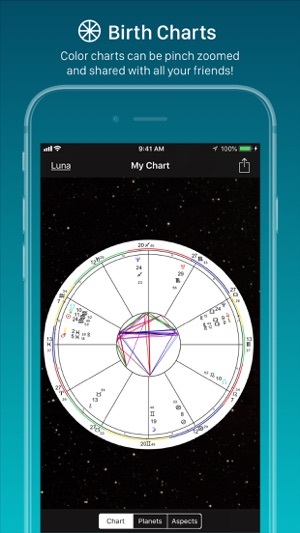 * Unlimited Birth Charts feature is only $9.99 - create and view as many charts as you like. * Read accurate & insightful personalized horoscopes every day. * Unlike most horoscopes, generated specifically for your unique birth chart. * Includes hundreds of paragraphs for every planetary position & aspect, including Chiron. * Uses the same acclaimed readings that you know and love from our desktop software. * The only app available that provides such penetrating accuracy. * Compare the charts between two people with a compatibility meter, comparison bi-wheel and aspect list for just 99¢ or $9.99 for unlimited access. 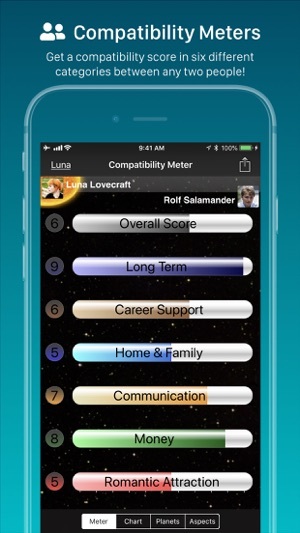 * Our new Compatibility Meter helps you discover potentials in romance, money, communication and more. * Discover the unique chemistry between any two people with insightful interpretations. * Your birth chart compared to current transits in a bi-wheel for just 99¢ each, or $9.99 for unlimited access to transit charts. * Provides date ranges for each transit so you can find windows of opportunity. * Enjoy complete interpretations for transiting planet positions & aspects. * Optionally include parallel and contra-parallel aspects to natal positions. 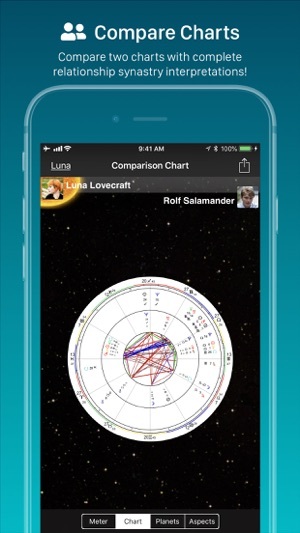 * Compare your birth chart to the current progressions in a bi-wheel for just 99¢ each. * Unlimited pass for progressed charts or Solar Arc progressions is $9.99 each. 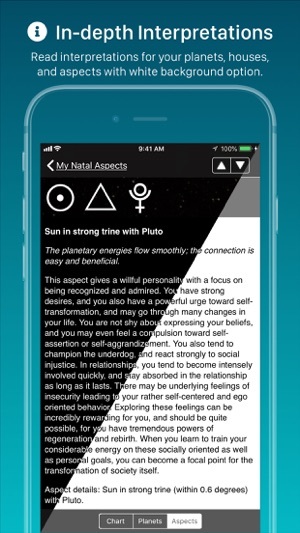 * Enjoy complete interpretations for progressed planet positions & aspects. * In-depth glossary of zodiac signs, planetary bodies, moon phases and other astrological terms. * Aspects are organized from strongest to weakest. * Review previous transit data associated with each chart. 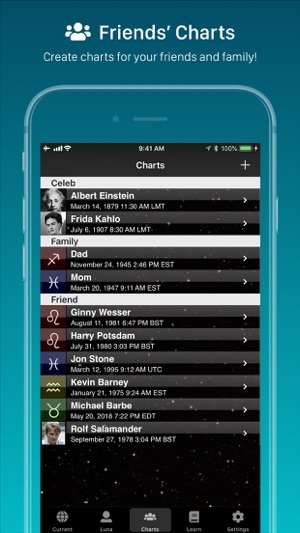 * Categorize your charts into friends, family, events, and more. * At a glance, see how close each aspect is, in terms of degrees. 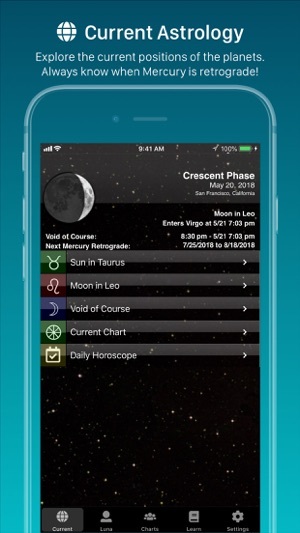 With TimePassages Pro, you have access to the most advanced astrology features available on a mobile device, truly putting the wisdom of the heavens into the palm of your hand! We have taken care of a problem of losing track of previously purchased charts while traveling; the change to the internal time zone was throwing off the purchase verification. Transit date/time storage now includes local time zone at the point of the original request. We have also added support for "one-click reviews," triggered by usage. Great app, good to see all aspects in one go. It gives me a great overview of what’s happening daily. © 2018 AstroGraph Software, Inc.